"Using Iron Speed Designer saved at least two person-months of time!" The Phoebe Swap Shop application was developed for hospital personnel and may be accessed through the employee intranet portal. The application is a platform for classified ads and carpool networking. All Phoebe Putney employees are encouraged to share and participate in the advertised services. 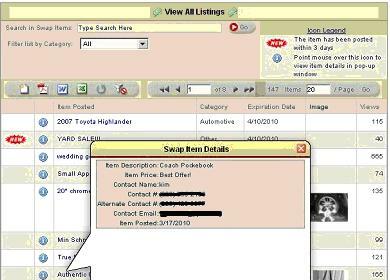 Employees view classified ads on the application main menu. Application users begin by logging into the application. Application security is tied directly to the Active Directory schema. Once a user is authenticated, he posts and searches for classified ads. The application allows users to filter search results by ad category. Classified ads are submitted online and expire programmatically. 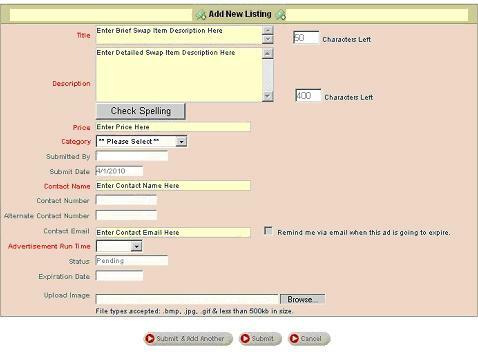 A user submitting new classified ads can upload images and schedule ad expiration dates. The user can request an email alert to remind him of ad expiration. Alerts are delivered programmatically, three days in advance of the expiration date. Email alerts are managed by an SQL Server Agent Job. Phoebe Swap Shop's integrated online help menu. Before ads are published to the Phoebe Swap Shop, they must pass a submission process. Ads are approved or denied based on current company policies. Upon approval, ads are displayed until the end user specified date. Denied and expired ads are automatically deleted from the system. Overall, the system is easy to use and provides our employees with a method to sell their unwanted items and network with other employees for carpooling. The application utilizes one Microsoft SQL Server database, six tables, and no database views. The largest database table holds the classified ads themselves. There are over 200 records in this table. The application consists of 21 pages. There are an estimated 1,500 users processing approximately 100 transactions per month. The project was completed in sixty hours by one developer. The Iron Speed Designer portion of the project took eight hours to complete. Limiting the size and type of images attached to a record. Resizing images before writing them to the database. Displaying a record panel in a pop up. Conditional Display of Field, Label, and Value. Catch Selected Index Changed Event in a Table Panel. We also integrated Infragistics UltraWebNavigator and WebSpellCheckern controls to complete the project. These customizations took approximately 40 hours to complete. We customized the ad display layout pages to show a single record panel with a featured ad of the hour. To implement this, we simply customized a default setting with our own custom CSS. We modified the Eiger page style in Iron Speed Designer to match our company logo colors and intranet portal. We initially inherited an application developed by hand, in classic ASP. With demand growing for different features, we decided to utilize Iron Speed Designer for expedited delivery and enhanced functionality. Using Iron Speed Designer saved at least one to two person-months, as only one developer was required. The cost savings are unknown; however, the experience and knowledge is priceless. Without using Iron Speed Designer, the project probably would have taken two to three times longer. Although the project size was small in scope, using Iron Speed Designer expedited application development time significantly. With its ease of use, excellent user interface, and advanced code functionality, we were able to create and deliver first class applications to our end users. The project could have been completed without Iron Speed Designer, but would have been more time-consuming and frustrating. In the future, we may implement the ability for users to upload multiple images and display them in a Silverlight style image carousel. William Goodwin entered the I.T. field through the U.S. Marine Corps as a computer programmer and Small Systems Specialist. He has 17 years of I.T. experience and is a Microsoft Certified Professional, Microsoft Office Specialist, and Microsoft Certified Systems Engineer. William has extensive experience and knowledge in VB, C#, ASP.Net, C++, Java, MS SQL, computer networks, and various other hardware and software. He holds an Associate of Applied Science in Computer Information Systems degree and has been using Iron Speed Designer since 2006. William is currently seeking the Microsoft Certified Technology Specialist and Microsoft Certified Professional Developer certifications.